Today is an exciting day, because today is the my first ever giveaway! I am literally so excited to be able to give something back to you all! 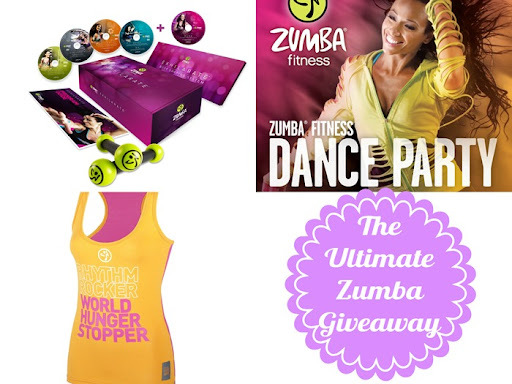 I have been meaning to hold one for a while, but didn’t really have the funds, but thankfully the lovely people at Zumba Fitness emailed me and asked me whether I would be interested in hosting a giveaway to celebrate their Great Calorie Drive. If you are unaware of what I’m talking about let me explain. Zumba Fitness have been on a mission to burn calories to raise money for the Untied Nations World Food Programme. So far this drive has helped Zumba Fitness donate over 98,000 meals to the World Food Programme… how amazing is that! They have even got the gorgeous Olympian Louis Smith MBE and Sugarbabe Jade Ewen in on the act, both are now Zumba ambassadors. From April till the end of June Zumba is encouraging people to check-in to classes via a free, downloadable smartphone app to donate the average number of calories burned in a Zumba class (750) to the United Nations World Food Programme. They are saying “Don’t just burn calories, donate them!” So while you are dancing your bum off in your Zumba class, you are not only getting fit and toned you are helping fight one of the worlds greatest health risks: hunger. Check out the video below to find out more. The giveaway is open until the 30th June and is only available to resident in the UK and Northern Ireland. Have you already taken part in Zumba Fitness great Calorie Drive? Are you a huge fan of Zumba like I am? Did you see my blog post on the weightless results I got thanks to incorporating Zumba Fitness into my regime?